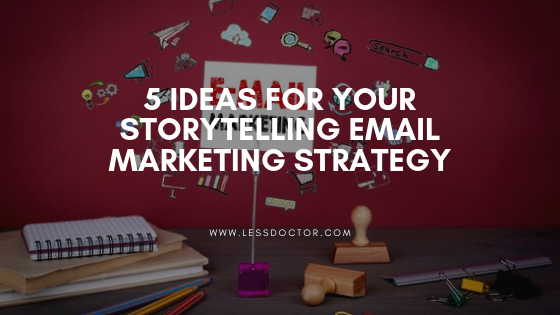 Let’s say that you have finally decided to invest in your company’s digital marketing strategy; don’t tell us that you haven’t included email marketing in your plans! It’s one of the most efficient tools regarding engagement and communication with clients, so we really hope this article changes your mind! How will we convince you? Well, we’ve been loving an email marketing trend lately that can help the laziest person create a nice and original newsletter in a few minutes. Need some help with your newsletters’ content? You’re not feeling inspired? Don’t you worry! If there is something that is present in our lives every single day and is the base of social interactions among people, it is stories. In this post, we want to show you how storytelling can help you engage your subscribers to the point they will be anxious to receive your next chapter… we mean, newsletter. Everything comes with a story. Literally, everyone has a story behind them, and they are able to tell it. No exceptions. How can we apply this to our email marketing strategy? Remembering that we never forget good stories. How can we use this technique to create newsletters? You are probably wondering how can you include a story in your newsletters’ content. Well, unfortunately, we can’t write it for you, but we can give you some advice on how to do it! Who is going to sell a product better than someone that has already tried it and loved it? That’s right. Your clients’ testimonies and opinions are incredibly useful because potential clients can identify themselves with them. Ask for your clients’ opinions and include them in your newsletter. However, be careful: you must be ready to include some negative points or these opinions will seem fake. Use the data and stories you see around you to relate it with your company. Let’s say you’ve found a nicely written article about the most beautiful villages in your area, and your company is dedicated to rent rural houses. Well, use this to promote the beautiful cottages you may have in some of these villages! You can do this with almost any curious fact you find out there; link it to your company, to your brand and to the values you stand by and you will effectively promote your product. Good stories will always be good; even if it looks too simple, don’t try to force or complicate things. Your clients will for sure understand your message. For example, the Spanish airline Vueling sent an email marketing campaign with the popular story of the groundhog day, and how Phil the groundhog predicts the weather, to encourage its clients to travel during winter. Easy peasy. You can also use literature! How about linking your perfume online store with the thriller The Perfume. Risky, we know… but original! People are naturally curious; they will probably like to know how you started your business or any funny anecdotes that have happened to you since then. This will make them feel closer to you. Why did you choose these corporate colors? Who helped you? Who mocked you when you were just starting your business? Be honest and try to entertain your audience with curious facts. In the example above, Coca-Cola tells us how a polar bear became their emblematic mascot. Interesting! Think about it; it makes sense to read a Christmas story in December and to read about a beach vacation during July, right? We highly recommend to adapt your email marketing strategy to the season and to take advantage of special dates and occasions! Your clients will love to read a fun Halloween themed story if Halloween is around the corner!